We are thrilled to announce our 2016 – 2017 season and that season tickets are available. We are always excited to announce our new season, we’ve found some exciting, innovative, new artists and we look forward to seeing the community excitement around this new season. There’s diversity, favorites we’ve received consistent requests for, and consistent themes that run throughout the year. We hope you’ll join us! Join us at the Trash Bash! Get your dance on Fairbanks! It’s time to begin our Community Dance Team. The Community Dance Team is comprised of an unlimited number of performers spanning many generations of Fairbanks’ vast and diverse community. We are seeking dancers as young as 13 and as old as 80. The group will perform a progressive dance designed to be performed while walking. 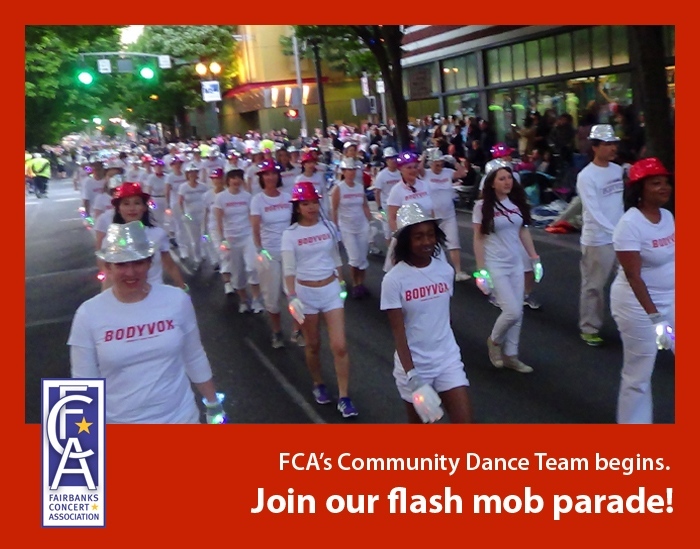 We invite you and your friends to learn a simple dance combination and participate in a flash mob later in the spring. Courtland Weaver, Artistic Director of North Star Ballet, will teach a simple dance combination that you can do while walking.